Because so much of you will be left behind in the hearts of all of us. You taught us to grow and do the best we can. Your wisdom and guidance helped us to strive to be the best that we can be. And know that the gifts you left behind will continue to guide us. Mrs. Polansky, look back with pride and dignity. It is your time to reap the rewards of your commitment. And we want you to know, we will always remember your dedication. Thank you for everything you have done for all of us and for our wonderful school. 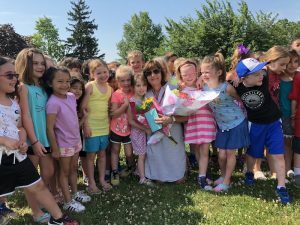 Congratulations on your retirement, Mrs. Polansky!